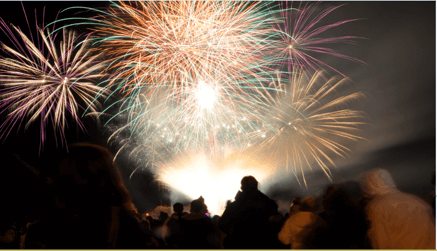 Whether you’re getting excited about putting on your own Bonfire Night fireworks, or looking forward to seeing a professional display, there are many spectacular types of firework to enjoy. Here’s a quick guide to the main firework types, and which (in our opinion) you should choose for the most impressive display. If you like your fireworks to shoot high into the sky, rockets are a great choice for a home display. Released singly, each rocket firework whooshes to heights of up to 60 feet (18 metres) before exploding into a shower of sparks. Always popular in DIY firework displays, rockets are a classic crowd pleaser for any occasion. Choose a variety of colours and sizes for maximum interest. For something with a bit more spark, Roman candles can definitely provide the ‘wow’ factor. Unlike a rocket, which fires just once, a Roman candle gives off a whole series of bursts, usually featuring coloured stars or other shapes. Sometimes, several Roman candles are tied together in ‘batteries’ or ‘cakes’ before being let off, for a more spectacular effect. Some Roman candles, called bombettes or comets, contain shots that are designed to fire simultaneously instead of one by one, for a more explosive impact. There’s something truly impressive about a shower of sparks from a fiery fountain. These fireworks are ground-based, and can be placed strategically around a venue to create an impressive illumination – without any loud bangs. Different types of fountain fireworks include gerbs and mines, and are often used in pyrotechnic displays for big events. A home fireworks evening wouldn’t be the same without sparklers. These hand-held sparkling sticks are a favourite with adults and children alike, and you may have fond memories of making illuminated shapes with them, or spelling out words in the darkness. A word of warning: sparklers can get extremely hot. Follow the safety instructions to the letter to avoid accidental injury, and do not give sparklers to children under the age of 5. Named after the martyr St Catherine of Alexandria, who was sentenced to death on a spinning torture instrument, Catherine wheels are a type of rotating firework that can produce some impressive effects. Because they don’t rise up into the sky, it’s important to ensure that they are visible by the whole crowd, so they may not be the best choice for larger events. Sometimes also known as pinwheels, these spinning spectacles can create some amazing spiral effects. While we have a soft spot for all the fireworks mentioned so far, in our view aerial shells have the edge. Classed as a Category 4 firework, these are only licensed for use in professional firework displays, but their breath-taking effects will be worth the entrance fee. Aerial shells are endlessly versatile, creating a wide range of different shapes and effects in the sky, from floral effects like chrysanthemums and peonies, to strobes and crosettes. Because of this variety, skilled pyrotechnicians can use aerial shells to create stunning shows that are endlessly entertaining.